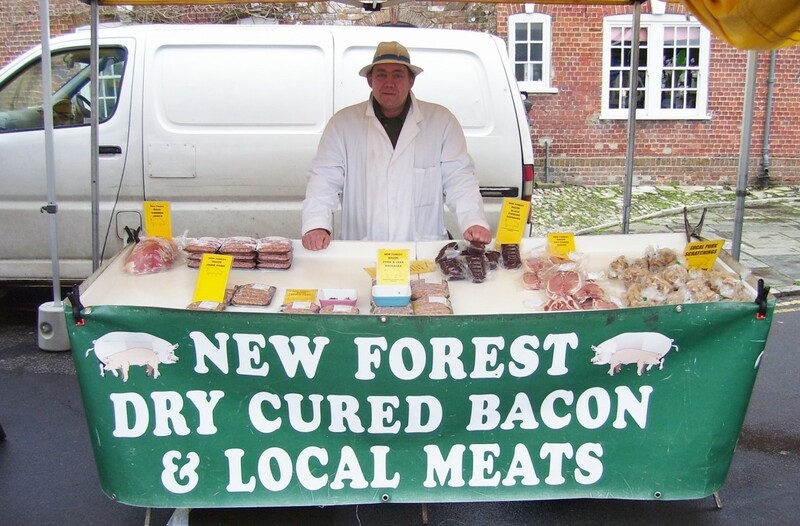 MARKET REGULAR: John of Clayford Farm who sells New Forest dry cured bacon and local meats, is a regular face at Wareham Market and sells very tasty sausages, burgers and bacon, some of which is cured. SAY CHEESE: Dave of Ford Farm on the Ashley Cheese Estate was tempting market visitors with various cheese, butter and other dairy produce. He is another regular on the Saturday market day. DORSET HAMPER: In front of me is my shop for the day, which includes cheese and butter from Fox Farm; venison burgers from New Forest Bacon and Local Meats; strawberries, cabbage, garlic and apples from an independent fruit and veg supplier and fresh bread and cakes from a stallholder from the Yeovil area. Picture by Dhaval Gite. WELL PRESERVED: The owner of these hand-made jams, preserves and pickles did not want to be photographed but these products are better than their supermarket equivalents by a country mile. MARKET DAY: This is looking at the market from the side of the road as you up to Stoborough. It shows the lay out of the different stalls on the Quay. 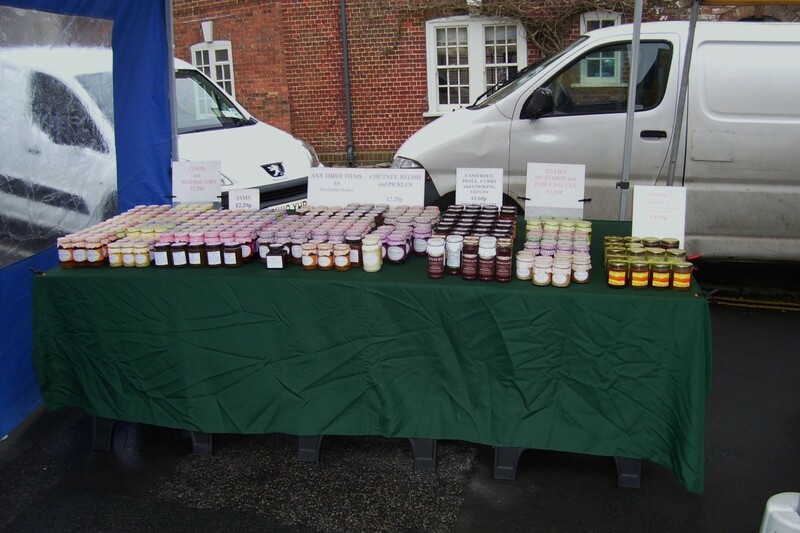 FOR the past month I have made the effort to travel to the Wareham Market and support local producers and small businesses. It is a privilege to be in a position now to have enough disposable income to support them and practice what I preach on this blog and its supporting Facebook and Twitter pages. 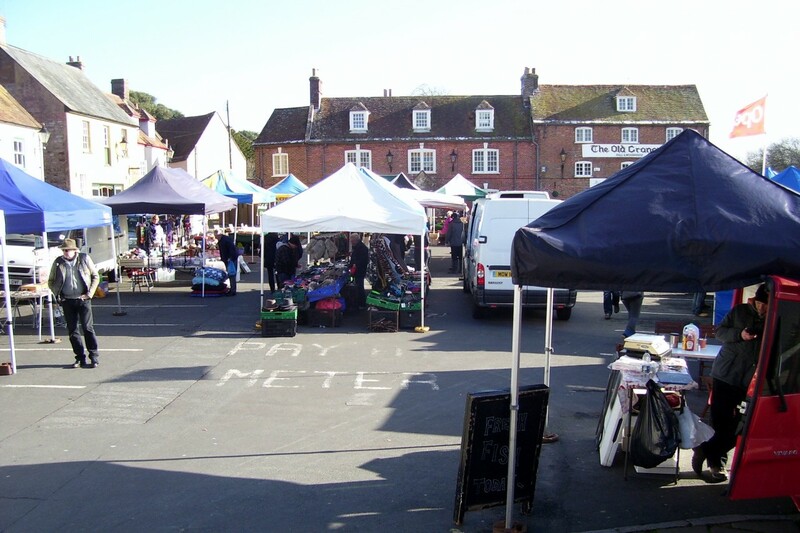 Every Saturday between 8am and 2pm on Wareham Quay stalls featuring local meat, fruit and vegetables, cheese and butter, flowers and preserves jockey for position to sell their speciality produce to local customers. Wareham is a historic market town and is on the River Frome eight miles south west of Poole. It is built on a low dry island between the marshy river plains. The Frome Valley runs nearby through an area of unresistant sand, clay and gravel rocks and much of the valley has wide plains and marsh land. At its estuary the river forms the wide shallow of Poole Harbour. To make the effort to go to these places gives the feeling of satisfaction of giving small independent business a chance to prove themselves against corporate brand grocers like Tesco and Asda, who can supply nicely packaged fruit, veg and meat in the right shape and quantity, but is it the same quality? 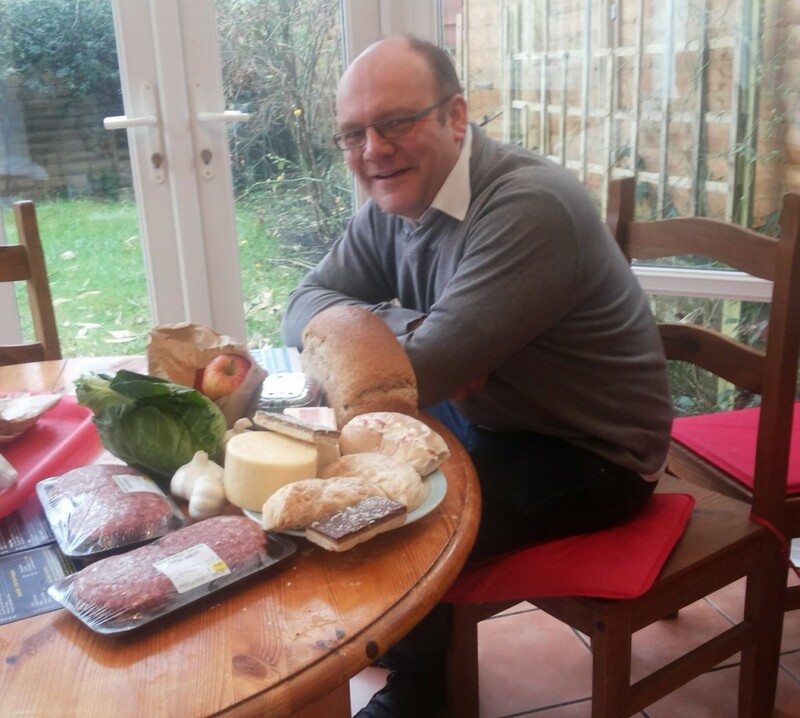 John of Clayford Farm regularly attends the markets and sells an array of specially-made sausages, bacon and burgers. I was lucky enough to purchase the last batch of venison burgers. 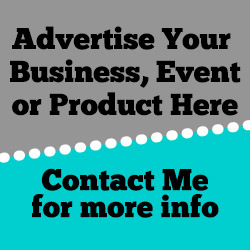 Although the Hampshire-based business doesn’t have a website, there is a Facebook page that you can support that is regularly updated. I have got three packets of their sausages that include mushroom and pork and pork and leek varieties. 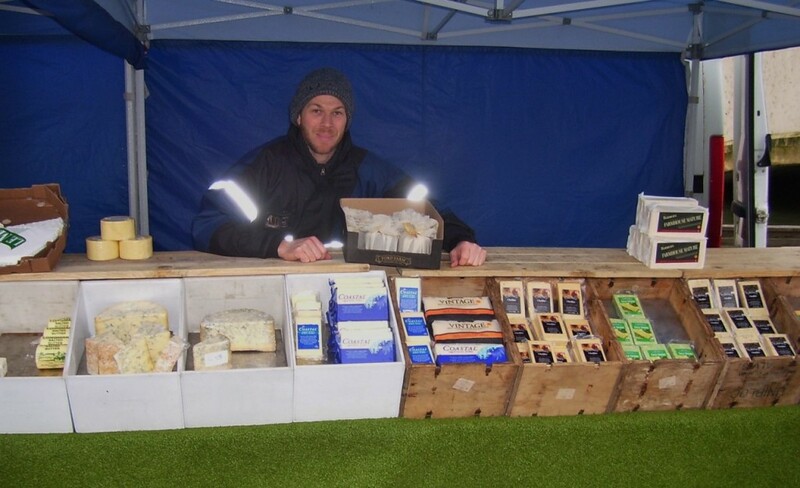 David from Ford Farm on the Ashley Chase Estate was selling speciality cheese, butter and other dairy produce and a regular stall holder there. They are located within an Area of Outstanding Natural Beauty. Milk is used from their dairy herd on the estate and other herds within a 30-mile radius. Their rich and creamy milk makes exclusive, award-winning West Country farmhouse cheese. A cheese made from sheep’s milk at Ford Farm won a coveted Gold Award at the World Cheese Awards held at the NEC Birmingham as part of the BBC’s Good Food Show. A Gold Award was also given to the farm’s well known star performing brand – Wookey Hole Cave Aged Cheddar. There is also a couple from the Yeovil area who sell fresh bread and cakes on the day and I am a regular customer and can vouch for the quality of their produce. Towards the end of the market day, produce is discounted as it has to go, so bear this in mind if you are visiting. If anyone reading this wishes to come and support this market, please be prepared to bring cash and don’t expect anyone to have a Chip and Pin facility and some proper personal service, as opposed to from behind a computer screen or a check-out till at lightning speed.